Day 2 of Pack Ahead Bento Week is upon us! One thing I did want to make sure was to alternate lunches enough that it wasn't 5 days of nearly identical sandwiches or muffins or any one kind of lunch. Packing ahead actually made me more aware of it, I think, by seeing all the boxes lined up on the table. I moved items from box to box to come up with a good mix each day. Even in the picture above? I switched the order they are in. 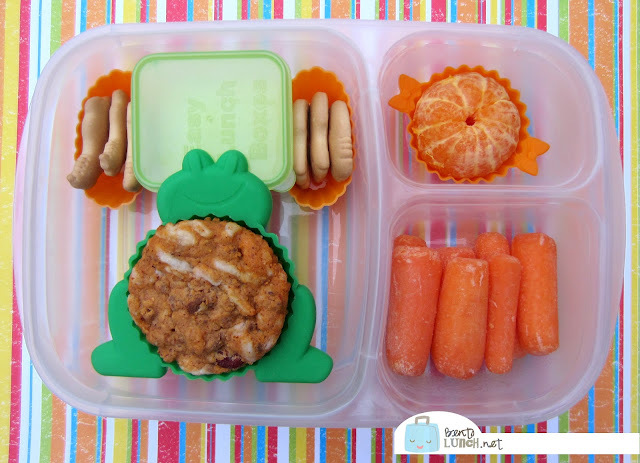 Today, both kids had a chili cornbread muffin from the freezer stash, tucked into a cute muffin cup instead of a paper wrapper, baby carrots with ranch dip in an Easy Lunchbox mini dipper, and a cutie orange. I also added a stick of string cheese for some extra protein and some animal crackers for a treat. Sunday evening assembly included peeling the cutie oranges, adding dip to the mini dippers, and switching the muffins from Christmas paper wrappers to the cuter silicone ones. I do make stuffed muffins ahead of time, whenever I have enough leftovers, to build a freezer stash. Morning prep included filling water bottles and adding the animal crackers, since they can't be left in the fridge for several days without getting soggy. Thanks! 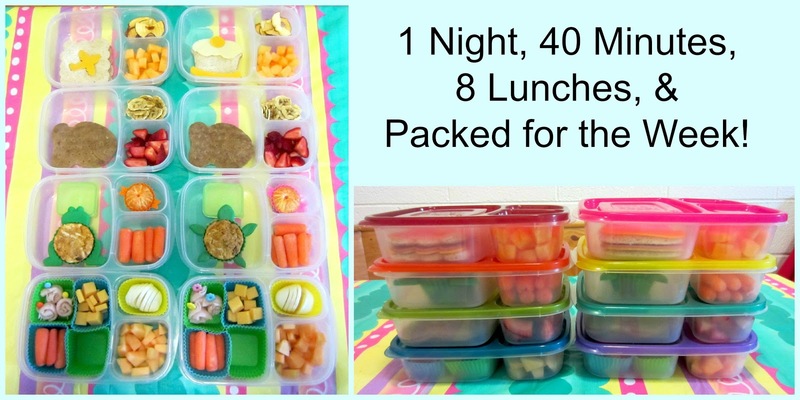 I am loving this idea, especially in the mornings! Do you have your muffin recipe available? I'm excited to see your results. The cutie wasn't dried out? My favorite corn muffin recipe is within the post, but you can also cheap and use a boxed mix. If I'm in a rush, boxed mix it is! Oh, I LOVE the muffin cups - where did you get those? And chili cornbread sounds yummy, I'm going to have to try to make them. I'm assuming you add chili to the your favorite cornbread recipe? The muffin cups, I found at Ross a few years ago. There were these two, another purple bug and a blue fish. I've found that the mandarins dry out if I peel them in advance. Did they have an issue with that? I think I also separated the segments too though. I'm a mom of two elementary kids and a toddler, and currently going to nursing school. I used to prepare on Sundays fearing the things they feed our kids. I WAS running out of ideas, but I found you! Thank you thank you! Was the chili muffin cup cold in the lunch box? How was it cold?